My friend Garudadwaja Iyengar got elevated to grand fatherhood with his son Koushik becoming the father of MANOJAVAM, son born to him and wife Hema Ganga. 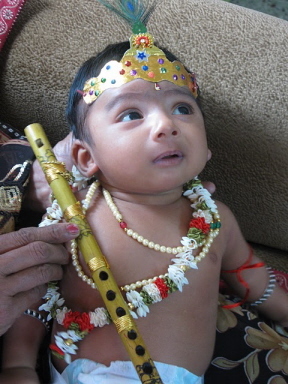 Manojavam was born in Mysore, Ganga's home town on 14th July 2010. Congratulations to Ganga and Koushik as also to my friend Iyengar and his wife Poornima BG. Manojavam is expected to become a resident of the United Arab Emirates in a few months from now and we wholeheartedly welcome him to UAE.